With the end of my practicum coming to an end and teaching my last class I thought I would write down my thoughts about instruction. When I first sat down with the Assistant Director of ZSR Reference dept. we talked about me teaching a class or two. I was both interested and intimidated at the same time. All I could think about was I had decided to go to Grad school because I didn’t want to teach. You see back then I was convinced I didn’t have the patience to teach nor did I have the understanding needed. I wasn’t confident in my own skills. What changed? I did basically I think in the last two years I’ve done some major growing up. While I still have some issues with tooting my on horn (but I’m getting better) I now know I’ve skills to share. As the semester continued I went along collecting information from the librarians about their jobs and journeys. But in the back of my mind I knew the time was coming when I would have to stand in front of a group of students not munch younger than me. In all honesty I think it was the support of my supervisor and the Instruction Librarian I co-taught with that helped so much. They were both critical in my preparation and they were very eager to share their thoughts with me. My first class was on Zotero. I was nervous and using a new tool, Prezi. I started the class with an introduction then walked the class through download and install of Zotero in Firefox and the Word Plug in. With a few hiccups we moved on to me showing how to pull in material. I had a whole lesson worked out to show different materials, what to do when it didn’t automatically pull in the information and then making a citation and bibliography using Zotero in Word. Unfortunately I ran out of time. I didn’t take into account the speed and level students would catch on. For future reference I would cut down on the introduction and just jump into the download and install. My second class was another big one as I had to lead the class alone, as my co-teacher was away at ACRL. So I was extra nervous and again I was using a new tool. I was using power point with the clickers. Which involved learning a new program…TurningPoint. I joked with one of the other librarians that I wondered if the whole class would show up. Of course the whole class showed up and we went through Scholarly Journals fairly quickly. Most students know about journals, well they know they exist. They might not know how much the library pays for them or why they should use them but they know there’s something called Journals. What surprised me, although it shouldn’t have, was that no one had used the Journal Finder tool and I don’t think any of them had used a database really. So the tips I shared was to not start in Journal Finder as it would just make life harder. For future reference I would have had them do an activity to show that they understood. Since I knew we would be talking more about them the next class I let them go a bit early. Scholarly databases and citing journals. By this time I thought I had the hang of it. I was focused on timing and making sure I got the lesson across in whole. I think I made my co-teacher proud. This time I didn’t do a presentation I used the library webpage to give examples. By showing how to do searches using their topic search terms I think I engaged them better. I made sure to stop and ask for answers to questions and asked if I was loosing anyone. I should them general and subject specific databases and had the general citation format written on the white board. For an activity I asked them all to find a relating article and pull it into Zotero for the next class. It was interesting to see those who used the databases I talked about and then to see them use the boolean searching and truncation tips I shared. None of them knew about these two things before hand. I felt proud of myself. The last class was a major challenge. But by this time I was more comfortable talking about sources, the weakness and strengths of sources. So I told them about a million times websites as sources was a tricky thing to master. Citing them would be even harder. I made a point to look at what others were saying about the subject, ZSR has a page about website sources and links to two other college’s thoughts. This helped a lot on pulling my own thoughts together. For the class I again relied on actual examples…but I felt it wasn’t as interactive as I might have wanted. For future reference I want to come up with better ways to communicate something that I’m not as skilled in. I think between shadowing and actually teaching my experience has grown 100%. I’m more comfortable in front of the class than I thought I would be. And I enjoy it immensely, which is a great surprise to me. There’s a lot of things I still need to learn about, like timing, engaging the students, and communicating a tricky subject matter. I would love to hear about other people thoughts on Bibliographic Instruction. How did you feel the first time you taught a class? Any tips you would like to share? Another busy week and I have the bags under my eyes to prove it. Tuesday I found myself on the reference desk solo. Unlike Spring Break however I wasn’t bombarded with telephone and chat questions but in person requests for help. Paper season is officially in effect. Most of the questions resulted in ILL requests. Which meant I got a lot of exposure to their ILL set up. After lunch I had the co-instruction class which included going over finding reference materials as suppose to general sources. After class I had another one on one meeting with the Science Liaison Librarian. Then I headed up to Special Collections to start working on an inventory project that has me working directly with their special collection, which is really (for the most part) a guy’s personal library that he donated in whole. I’m going through each book and seeing if shows up in the catalog. Surprisingly almost every other book is not showing up. Which is a major problem as he has some awesome texts that could help a lot of researchers. His library covered many areas. But no one knew they had theses titles. Thursday was a big day that started again on the reference desk as usual but after lunch I officially entered the world of instruction as I had my first chance to teach a class. It was Zotero and how to use it for their first assignment. It went faster than I thought and the fact that I was able to stay calm and not freak out before or after is a big success for me. The librarian that I’m co-teaching with said I did a wonderful job and am on track to becoming an excellent instructor. I had one student stay behind so I could help them some as they aren’t comfortable with technology. I ended the day again back in special collection talking with the librarians about how so many books could have been left off. I was sure to mention that it could have been just that one section as the titles are common and they show up others places and maybe people were confused and thought they had covered that one. Even though physically I’m near the end of my energy pool I still have a lot of excitement about the things to come. Just recapping my week shows how much I’ve done and how far I’ve come since January. Taking on the reference desk alone and not thinking twice about it. Prepping for a class and ignoring the rabid butterflies attacking my spleen. Talking to professionals and giving my thoughts on a project as if I’d been doing that kind of thing for years are all new and excitedly different things for me. I learned a lot this week, just like the other weeks but I think the biggest lesson came from teaching the class. And that would be to plan on teaching 1/3 of what you’ve plan to teach. I managed to get through most of it and show them how to use it for the first assignment which is due next week. But none of the fun, great, features that it holds. I teach another class next week. This week was the start of the second half of the semester for my site. 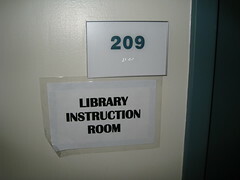 Which meant new set of Library Instruction classes. I had spent the first half observing a new librarian but this half I was partnering up with a veteran. We started a couple weeks back by going over the syllabus and emailing the students with the notice if they were going to stay then please stay and if not then go ahead and drop so those who really need the credit hour can join. In the end we had 15 students. I ended up picking three classes I wanted to teach myself and we were set for Tuesday. Well Tuesday came and two students didn’t show up and one student show up thinking she would just be added to the class without asking the professor ahead of time. Even though it was okay the librarian made her worried because he wanted her to learn an important lesson. The first class consisted of introductions and then we had them do a find it activity in the library. They were already split into groups and they had to find a specific department and ask some questions. They had about 15 minutes to do this then they had to come back to class and prepare a Powerpoint to share with the class. (My site gives their freshman laptop as part of their tuition). The presentations were actually pretty funny given they had only 10 minutes to put it together. Thursday found ourselves with a good amount of adds and drops but some how it managed to equal out again. We did some questions using the clickers to introduce research planning. The students seemed to enjoy the clickers as they aren’t very talkative, however we introduced some candy in the mix and that got them going. I think they were just hungry, we have the noon class…their minds are already on lunch when they come in. Next week we’ll be talking about actual research and finding sources. I added a fourth class that I will be teaching as the librarian I’m working with found out he will be out of town. So in total I will be teaching a class on Zotero, Databases, Journals, and Citations. Thursday I also observed my supervisor teach another BI (not to be confused with Bald Iguanas) class as well as her Library Instruction course. Her format is different from the one we’re employing as we are working with groups and she is allowing them to work individually. Plus the topics are different. Next week I’ll start packing in a lot the two days I’m there. I’ll be continuing my hours on the reference desk (which is getting busier every day), then I’ll have my class, starting a new round of one on one meetings with all the staffs and then working 2 hours in archives. I couldn’t be more excited about it. What two posts in the same week? Could this be?! I have some time so yes I’m writing about something not practicum related. Give me a break it’s my last semester. Anyways I just wanted to speak more on this Zotero tool. I’ve had a chance to use it more as I do my research for a paper I have due at the end of this month (read:Monday) and I wanted to share my thoughts on it. I’m a big supporter of open source software. If I happen upon a new software I try to see if there is an open source twin floating around. Sometimes I’m successful and sometimes I get a lot of junk. Not many people know what open source is and what it does. Open source can be applied to a lot more than technology and software but for the purpose of this post it’s being applied to software. 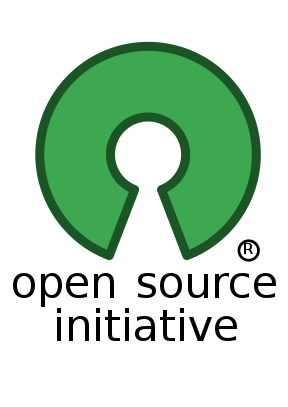 So “open source software is software whose source code is published and made available to the public, enabling anyone to copy, modify and redistribute the source code without paying royalties or fees.” Open source software is not software that has been pirated from some big named creator and given a different name. Pirated software is the software that is illegal and causing someone to loose money. While open source has it’s problems, it’s still legal and fair. What are those problems? Well for one is someone has to have the notion to create open source software. It’s sometimes a thankless job, because you aren’t going to get paid for doing it. You might receive donations from grateful users but don’t bank on it (pun intended =D). Because it’s free it will not be perfect. Some of the bells and whistles you will find on the $100 counterpart will probably never be introduced to the free open source version. However never is a strong word and people are always contributing to their favorite open source software making it better all the time. So if you want to use a software for a certain function don’t disregard the free open source one right out of hand if that function isn’t available. But enough about that, Zotero is why I sat down to write this post. And why I’m loving Zotero as suppose to my old way of managing my citations. Well first my old way, which entailed keeping a list of sources in a document in the same folder as the downloaded pdf files and typing up hand written notes. Then as I wrote my paper when ever I pulled from these pdfs or written notes, I would use the built in citation tool that came with my word processor and create a citation list that way. It was very time consuming and often times I found myself with a single quote or a unfinished citation that I had no idea where it came from. What makes Zotero so much better? Well first off it’s integrated into my browser, it’s not extra program window I have to keep open and risk closing it before I had a chance to save it. I don’t have to make sure I bring it when I head to the library or if I happen to get some free time to do some random researching/writing I don’t have to search for paper and pen. I can download it to any firefox browser sign in and it’s has all of my notes and sources ready to go. The best part is as I am searching online I can click one button and all the information I need is transfered to the zotero widget. As well a space to write detailed, formatted notes. When I’m ready to write the paper I can open up my word processor and because I went ahead and downloaded the word processing add-on I can do in text citations with another simple click of the button. I can view my notes about a source by running a report on my collection and saving it to my computer. When I’m done I can click create bibliography and it creates a simple bibliography that I can update just as easily. Seamless research at it’s best. However because it’s free means that it’s not perfect. Some sites don’t work as well as others and I do have to manually insert the information on some sources. However that’s not a big deal because I have the source in front of me will I do it. Which works fine when I have physical items as well. It doesn’t have all the bells and whistles as some of it’s more expensive cousins but it’s great for the basic if not better. I haven’t tested all of the features like shared collections, offline dealings, etc. But I do know that it’s great having all my sources saved to the cloud and all I have to do is sign on to zotero.org and pull them up if I don’t want to download the add-on and I don’t have my laptop. The user interface is great and not clunky at all and the updates made to it by the users are incredible. I recommend this to anyone who does lite to heavy research (read: EVERYONE!). The free accounts get 100MB of space, but the price for more isn’t bad and there are discounts for libraries and institutions. I’m curios to learn of other open source software that anyone else would like to recommend. As usual my day started with serving my time on the Reference desk. Again it was a slow morning, so I was able to play around on the catalog and compare their website to that of our own libraries. I had notice that they were using Cloud computing technology (if you watch tv you might now it as the commercials that end with some variation of “…to the cloud.) After lunch I came back to the desk because the student never came in for their hours, so I volunteered. It was much more busy during the afternoon hours. After getting off the desk I observed another LIB100 course. I ended the day with a professional development class that I was invited to join. The class was on the Zotero software. It’s getting easier and easier to be on the reference desk but then again I haven’t had to deal with a stressed out student who is having trouble finding sources for their paper which is due tomorrow morning. Secretly I’m looking forward to that. Every time I observe a course being taught I’m in slight awe because I still don’t think I will ever be capable of creating a lesson plan for a class let a lone a full blown course. Want me to give you a tour of the library? Sure I can do that. What me to tell you where a book would be located? No problem. Want me to teach you how to use a database? Err…Oh look at the time…I think my phone is ringing…so anyway great class. I ended the day with one of the best male librarian I’ve met so far. He’s awesome and he knows how to teach a class. I’d heard about Zotero at my internship but I wasn’t able to actually learn what it was. Now that I know what it is I’m in love. It’s such a simple tool and that’s why I liked it. At first I thought it was just another way to get students away from learning how to do citations. (Which had me thinking why am I do a APA citation guide?!) But then the class showed me what all could be done with the Zotero and in truth is more about allowing you to have more time to spend researching and not worrying about keeping all of your sources straight. Best of all it’s an open source software, great price point especially for all those tight library budgets. And as predicted there was no cake…sigh.